In both cash games and tournaments, you have to seek out value bets. You need to look under every rock, shine light in every corner. Insert other metaphors here. And you need, most of all, to think about when to try to extract value — especially in those situations when you can get value right now but in the future you cannot. A lot of online poker players habitually make the mistake of delaying making a value bet until a point in the hand when there is no more value out there to be had. The following is a real online example of that. In a six-handed game of 100NL ($0.50/$1), a recreational player opened to $3 from under the gun. Next to act, an experienced regular who plays seemingly every day three-bet to $11. It folded back around to the UTG player who called, and the flop came . Normally this would be a flop that might favor the three-bettor more. The under the gun player should not be continuing with 6-6, 7-7, 8-8, or even 9-9 after facing a three-bet, and therefore has a medium-to-weak range of TT-QQ and high-card hands like KQs, AQ, and so forth. This would encourage the three-bettor to value bet strong hands like QQ, KK, AA and bluff when he has missed. However, UTG is a recreational player, and not being the most positionally aware may call hands that connect well with this flop. This may explain why the flop action went check-check. The turn changed quite a bit. Previous air hands like QJ, KQ, and AQ have made top pair, JT has gone from a marginal draw to a decent one, and other hands turned a flush draw. The board is developing in a potentially dangerous way, but again there were no fireworks. Check-check. We can glean from this that no one has a strong hand on the turn. There is every reason for either player to make a bet, for value, for protection, or to build a pot, if either had a strong hand. The river was the , making the final board . Again, ordinarily, this would mean little for the UTG player. He should not open-raise too many hands from early position, and even more so he should not be calling three-bets out of position with . That said, some people turn up with hands they shouldn't. The under the gun player decided to bet $16 — a sizeable, 3/4-pot bet into $21 (after the rake). Would not a marginal hand like TT or JJ have bet already? Would a player with those hands bet this size at this juncture? It is hard to say what UTG has, but his hand looks strong. Remember there were lots of draws on the turn, but the player did not bet. A hand like AQ could have bet $16 on the turn, but didn't, and wouldn't need to bet that size now. There is nothing left to fear. Online you will find recreational players mistiming their bluffs, which is the flip side of what we're about to see, a mistimed value bet. Were that the case here — e.g., a mistimed bluff with JT — from under the gun with this bet, the regular next to act could just call. If it isn't a mistimed bluff in under the gun's hand, it looks like a strong hand that wasn't strong until the river, namely three nines. Our ultimate grinder decided it was time to move all in for $90 total with . He was called by UTG who had . No one thinks it possible that you folded aces preflop, so if you do, you'll surely deceive people. But that's obviously not in and of itself a good reason to do it. It's just the same here. 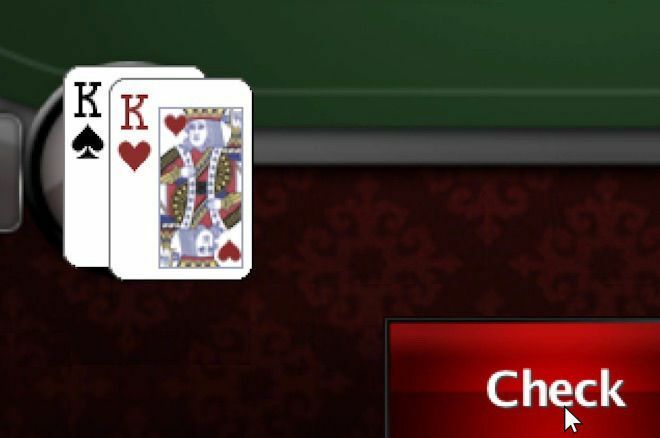 Sure, the under-the-gun player will have a hard time putting his opponent on kings after he checked the flop, and checked the turn, and then shoved the river. But that is sort of besides the point. What is so puzzling about the hand of course is that this value was out there to be found both on the flop and the turn. But not betting on either street is going to lead to something else, such as the desire on the river to make up for value missed on previous streets. If you end up doing that, you need to make sure the strength of your hand hasn't changed as the cards came out. Which of course, in this case, the strength of pocket kings did.